Mullein is a soft (almost velvet-like) biennial that can grow very tall. 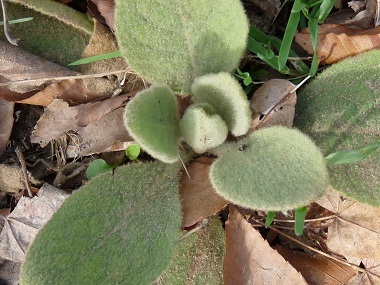 This dicotyledonous plant produces a rosette of leaves in its first year of growth. 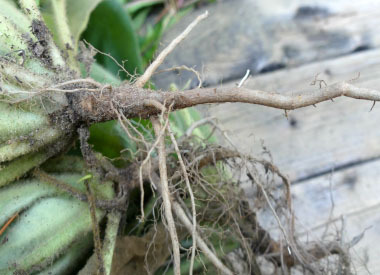 The second year plant normally produces a single unbranched stem. The tall pole-like stem ends at a dense spike of yellow flowers. It is a common wild edible plant that spreads by prolifically producing seeds, but rarely becomes aggressively invasive, since its seed requires open ground to germinate. The common name, mullein, comes from the German language, meaning king’s candle because of its scepter-like, candle-straight growth. Depending on the summer weather conditions, this wild edible may not produce a lot of flowers. 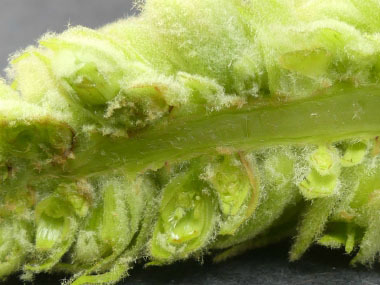 All parts of this plant are covered with star-shaped trichomes. This covering is particularly thick on the leaves, giving them a silvery appearance. 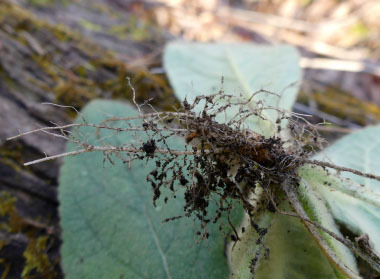 As its other name implies, mullein leaves were once used as toilet paper. 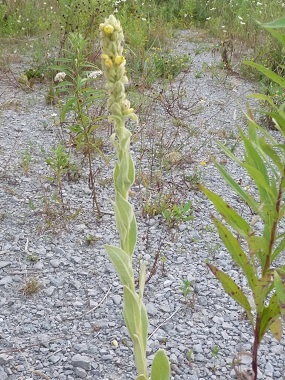 Distinguishing Features: Mullein in its second year is a tall, erect stem that can grow very high. It has soft leaves, and yellow flowers at the top of the plant giving this wild edible a very unique appearance. 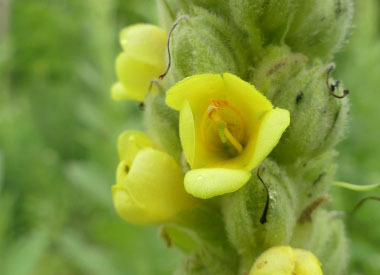 Flowers: The central stem of the mullein plant terminates in a dense spike of pale yellow flowers that generally measure anywhere from 5 to 60 cm (2" to 2') long. Each flower is about 2 cm (¾") across and consists of five pale petals, five hairy green sepals, five stamens, and a pistil. The three upper stamens are covered with white or yellow hairs, while the two lower stamens are hairless. Blooming period usually occurs during the summer and lasts about six weeks. Only a few flowers are in bloom at any one given time. Each flower is replaced by a seed capsule with 2 cells, each cell containing numerous tiny seeds. Fields of Nutrition has medicinal benefits and vitamin/mineral content of Mullein. 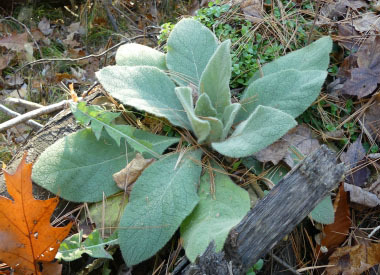 Leaves: First year mullein leaves form a basal rosette, with large, velvety-like, long-oval, gray-green, leaves that can grow up to 50 cm long. The second year, the basal leaves precede a stout, erect flower stalk. 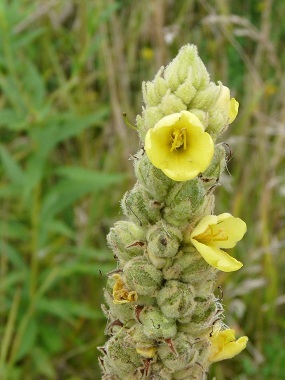 Height: Mullein can reach heights of just over 2 metres. 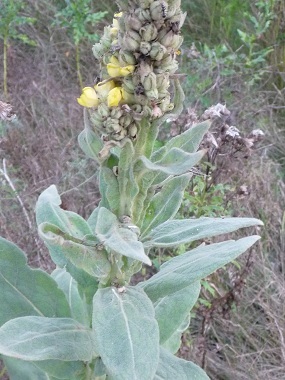 Habitat: Mullein can be found growing in open fields, waste places, disturbed areas, railway embankments and similar dry sunny localities. Other name: Cowboy Toilet Paper.